A really cool opportunity came my way this weekend, and actually being around (for a change) to participate in it was pretty extraordinary. I'm heading to Vegas this week for a few days of day drinking, night eating, and sun soaking with Big Hungry Melinda, so this is the post for the week, and I hope you think it's fun. Squeeeeee! 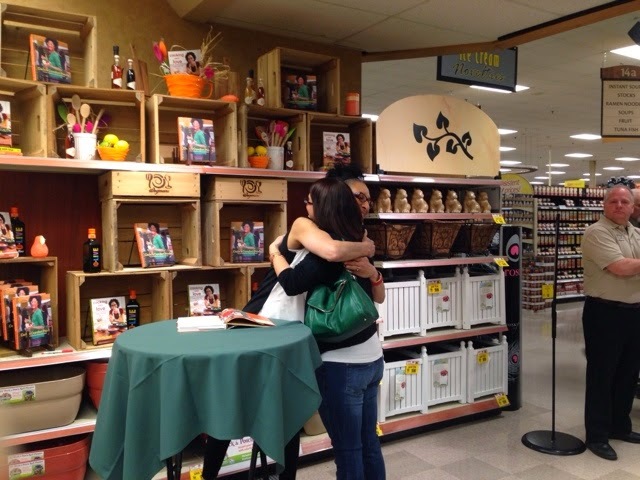 I blocked today on my calendar, and eagerly awaited my chance to meet her. Well today was the day! 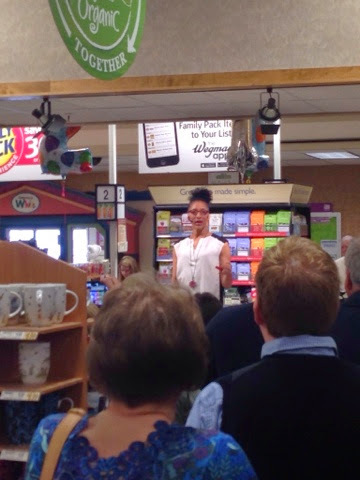 I shot out of bed like a rocket this morning, and arrived at a Wegmans two full hours ahead of her call time. The event was incredibly well organized, and I had fun standing in line with new foodie friends Diane and Naz in Group A, the first bundle of people to meet and greet Carla. 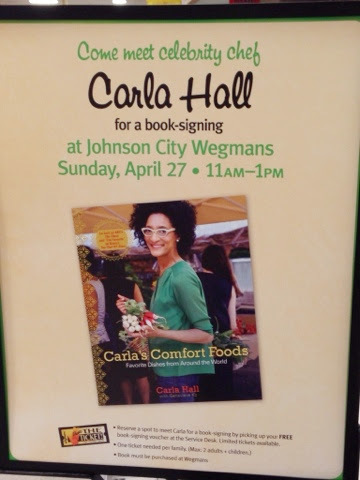 Around 11, Carla came out to speak shortly about her new book, Carla's Comfort Foods. 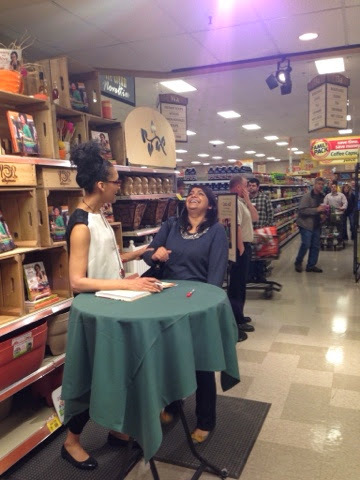 She took questions from the crowd, and I asked her why she initially tried out for Top Chef. Turns out a bunch of her coworkers encouraged her, but it was the way she told the story, with inflection, excitement, and massive energy, that gave me a peek into why this woman has become a star. She has that essential spark that draw people to her - like the successful beauty queens I know - that's undeniable. As people walked by her in our (always busy) Wegmans, she complimented them on the groceries in their carts. So imagine her description of her new book interjected with, "Ooh, mango! I love it!" She's funny! She's so friendly and genuine! Check her out, giving Naz's arm a gentle squeeze! I was so excited once I was this close, I missed getting pictures of Diane with Carla (sorry about that, Diane!!) and seconds later, it was my turn. Yeah, she's a hugger. How fun is that? She noticed my BHS shirt, so I told her briefly about my blog. She asked if I would put a recipe from her book on the blog, and I noted that I was excited about the minted mushy peas recipe, because my mother-in-law had asked me to make mushy peas for Thanksgiving this year. 1. Bring the cream and 1/4 tsp salt to a boil in a large skillet over medium heat. Boil for 2 min. 2. Add the peas and mint, and stir until heated through. Transfer to a blender or food processor and pulse to purée half the peas. Season to taste with salt and pepper, shout Hootie Hoo, and serve immediately. Oh, and I know a couple of you whiners are thinking right now, "Ew! Mushed up peas? Gross!" To you, I say, try them! I've had them in the UK twice now, very different versions, and loved both. Especially made with fresh peas, they are spring's version of squash purée - bright, clean, and vegetal. Very delicious. Don't knock it until you've tried it! 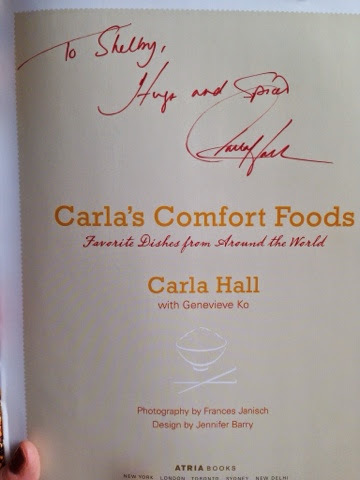 I'm super inspired by Carla, because like me, she came to her food calling a bit late, and she's only become famous recently, which by our celebrity standards is late in life. Maybe there's hope yet for a Big Hungry Shelby show on the Travel Channel? Here's hoping! When I get back fom Vegas, I can't wait to rip into her book and make chicken soup with chicken liver dumplings, roasted tomato jam (well, I'll wait to make that until Shawn's garden starts cranking out red this summer), and her version of palak paneer, my favorite Indian spinach and cheese curry. Meeting Carla today has left me reinvigorated about my blog - I've been so busy at work and with the pageant recently, my passion has been waning a bit. 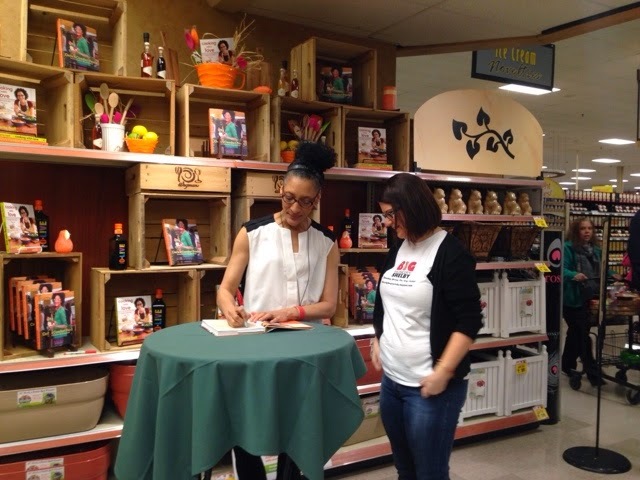 But to meet this woman so invested in her love of flavor and translating world cuisine in a comforting way for Americans, and absorbing her warm, funny, gregarious presence, has relit the flame. In Vegas, we're set up for sushi, modern American, and Chinese-Meixcan fusion, so get ready for some fun posts next week and beyond. Something yummy this way comes, my Hungries! My personality is big; my hunger is bigger! Thanks for sharing one of my recipes with your little hungries. It was so great meeting you and your new friends. Enjoy Vegas! Pace yourself. Thanks for reading, Carla, and I'm glad you enjoyed your time in our little worker of the world! Hope you got a taste of spiedies! Amazing! Love this story and may give those peas a shot. Viva ras el hanot!!! Hootie hoo!!! Such a cool day, JP. Wish you could have been here! I love your blog! 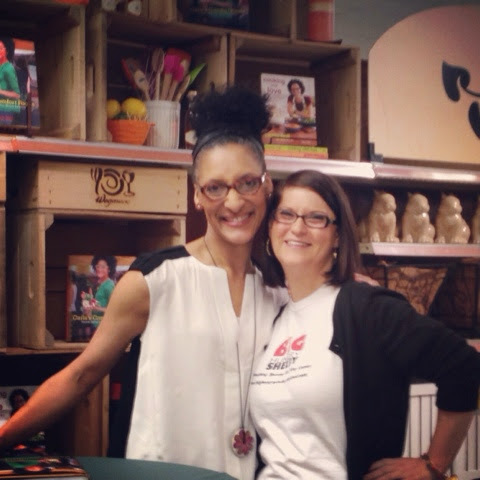 Also, now, you have been blessed by Carla Hall! I might try that mushy peas recipe tonight! Let us know how it turns out, Naz! I Just Met a Wine Bar Named Maria!